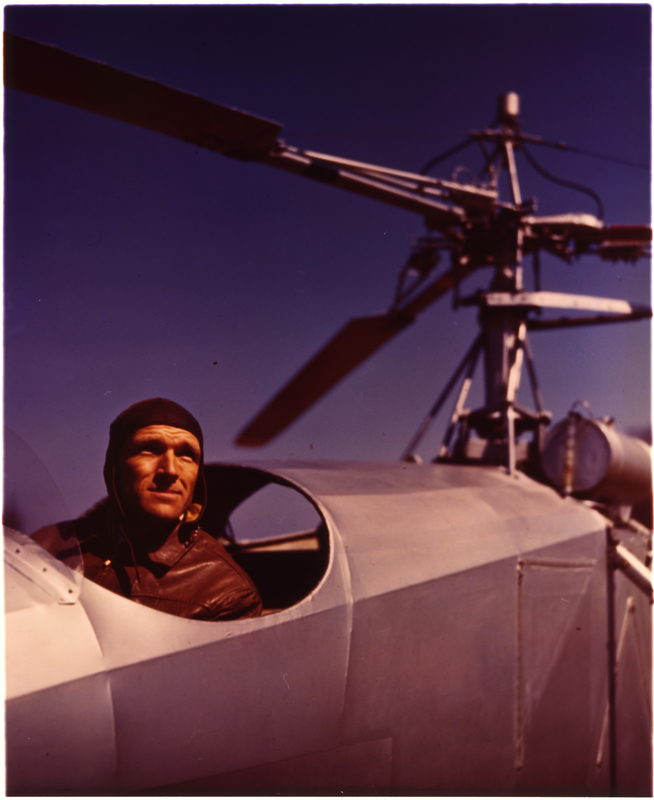 14 January 1942: Chief Test Pilot Charles Lester (“Les”) Morris (1908–1991) made the first flight of the Vought-Sikorsky VS-316A at Stratford, Connecticut. The first flight lasted approximately 3 minutes, and by the end of the day, Morris had made 6 flights totaling 25 minutes duration. 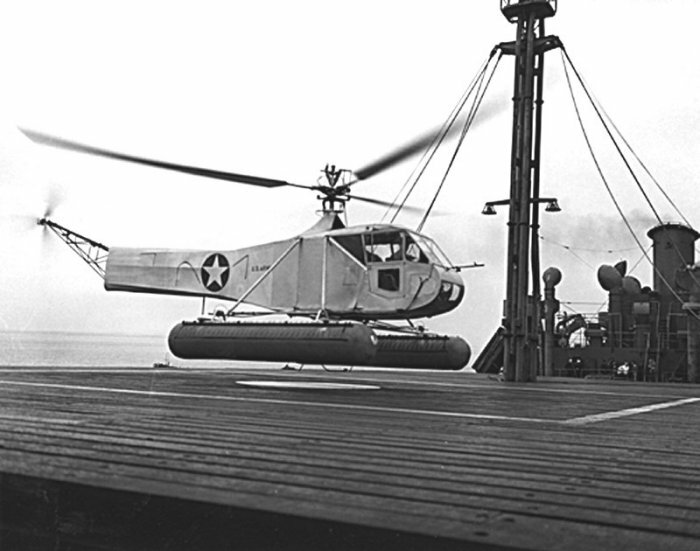 The VS-316A (which was designated XR-4 by the U.S. Army Air Corps and assigned serial number 41-18874), established the single main rotor/anti-torque tail rotor configuration. It was a two-place helicopter with side-by-side seating and dual flight controls. The fabric-covered three-blade main rotor was 38 feet (11.582 meters) in diameter and turned counter-clockwise as seen from above. (The advancing blade is on the helicopter’s right.) The tail rotor was mounted to the aft end of the tail boom in a tractor configuration, and rotated counter-clockwise when seen from the helicopter’s right side. The VS-316A was 33 feet, 11.5 inches (10.351 meters) long and 12 feet, 5 inches (3.785 meters) high. It weighed 2,010 pounds (911.7 kilograms) empty and the maximum gross weight was 2,540 pounds (1,152.1 kilograms). The original engine installed in the VS-316A was an air-cooled, normally-aspirated, 499.805-cubic-inch-displacement (8.190 liter) Warner Aircraft Corporation Scarab SS-50 seven-cylinder radial engine with a compression ratio of 5.55:1. The SS-50 was a direct-drive engine, with a maximum continuous power rating of 109 horsepower at 1,865 r.p.m., and 145 horsepower at 2,050 r.p.m. at Sea Level for takeoff. 73-octane gasoline was required. The SS50 was 2 feet, 5 inches (0.737 meters) long, 3 feet, 0-9/16 inches (0.929 meters) in diameter and weighed 306 pounds (139 kilograms). 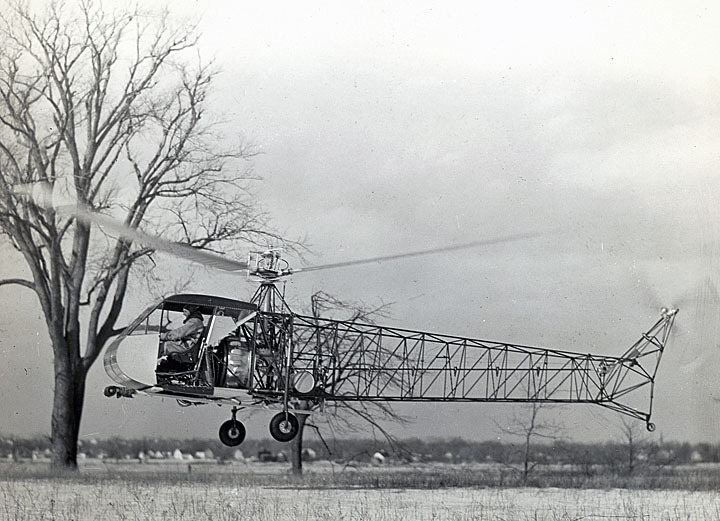 Numerous modifications were made, including lengthening the main rotor blades, covering them with metal, and upgrading the engine to a 200 horsepower Warner R-550-1 Super Scarab. The XR-4 was redesignated XR-4C. 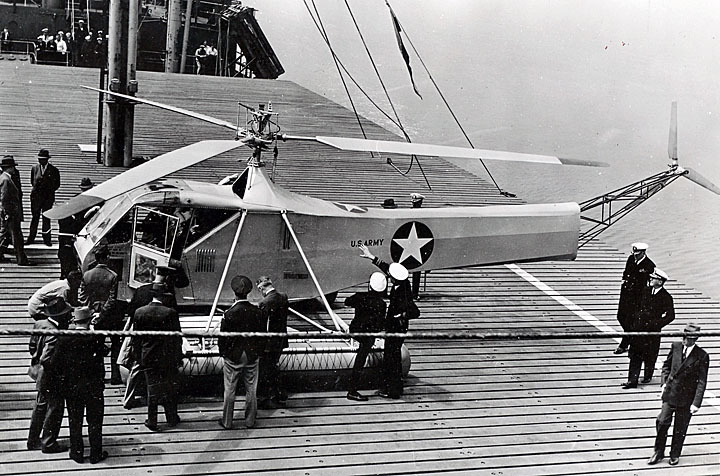 This would be the world’s first production helicopter. It is at the Steven F. Udvar-Hazy Center of the Smithsonian National Air and Space Museum. 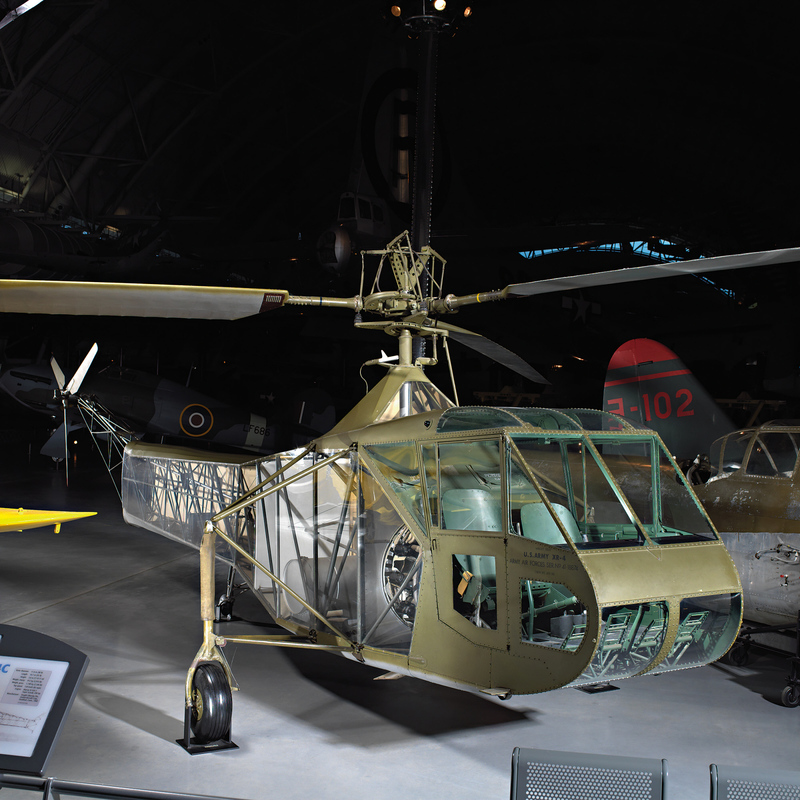 17 May 1942: After a 761 mile (1,224.7 kilometer) flight over five days, test pilot Charles Lester (“Les”) Morris and Igor Sikorsky arrived at Wright Field, Dayton, Ohio, to deliver the U.S. Army’s first helicopter, the Vought-Sikorsky XR-4. Morris hovered directly up to the base administration building and landed there. 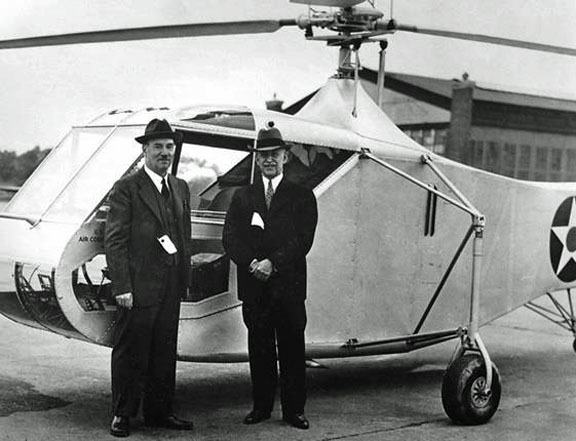 He and Sikorsky were greeted by a large group of people which included Lieutenant Colonel Hollingsworth Franklin (“Frank”) Gregory, the Army’s designated rotorcraft expert, and pioneer aviator Orville Wright. 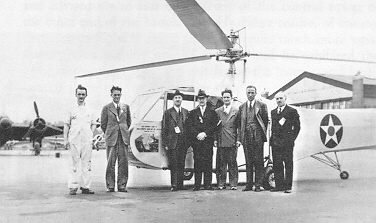 From the Sikorsky factory at Stratford, Connecticut, to Wright Field, Ohio, was 761 miles (1,224.7 kilometers), direct. Because of the XR-4’s low speed and short range (weight limitations restricted the quantity of gasoline it could carry) the distance was covered in sixteen separate flights with a total flight time of 16 hours, 10 minutes. The longest single flight lasted 1 hour, 50 minutes, a new world’s record for helicopter flight endurance. 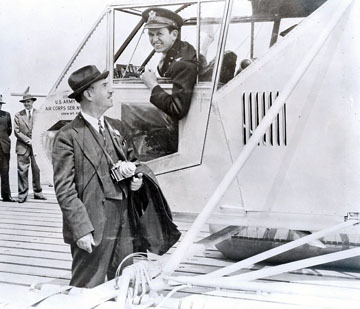 Igor Sikorsky joined Les Morris for the final leg of the flight. The XR-4 was 33 feet, 11.5 inches (10.351 meters) long and 12 feet, 5 inches (3.785 meters) high. It weighed 2,010 pounds (911.7 kilograms) empty and the maximum gross weight was 2,540 pounds (1,152.1 kilograms). The VS-316A had originally been powered by a 499.8-cubic-inch-displacement (8.19 liter) air-cooled Warner Aircraft Corporation Scarab SS-50 (R-500-1) seven-cylinder radial engine, rated at 145 horsepower at 2,050 r.p.m. In the XR-4 configuration, the engine was upgraded to an air-cooled, direct-drive 555.298-cubic-inch-displacement (9.100 liter) Warner Super Scarab SS185 (R-550-3) seven-cylinder radial engine with a compression ration of 6.20:1. The R-550-3 was rated at 185 horsepower at 2,175 r.p.m. at Sea Level, and 200 horsepower at 2,475 r.p.m (five minute limit) for takeoff. The engine was placed backwards in the aircraft with the propeller shaft driving a short driveshaft through a clutch to a 90° gear box and the transmission. The R-550-3 weighed 344 pounds (156 kilograms). The XR-4 was redesignated XR-4C. This would be the world’s first production helicopter. It is at the Steven F. Udvar-Hazy Center of the Smithsonian National Air and Space Museum. 6–7 May 1943: To determine the feasibility of operating helicopters from the decks of merchant ships for antisubmarine patrols, Colonel Hollingsworth Franklin (“Frank”) Gregory, U.S. Army Air Corps, made 23 landings and takeoffs from the tanker SS Bunker Hill in Long Island Sound, flying the Army’s Vought-Sikorsky XR-4, 41-18874. He continued to practice landings and takeoffs that afternoon with the ship at anchor, then underway at five, seven and one-half, ten and fifteen knots. As the speed increased the landings became more difficult because of increased turbulence over the superstructure but the helicopter proved to be completely controllable. The next morning guests were ferried out to the BUNKER HILL . . . A total of 97 names were on the guest list. Gregory put on an impressive and flawless performance as the ship cruised at various speeds up to 15 knots and on various headings with relation to the wind which was blowing at 12 knots. . . .
—”The Helicopter as an Anti-Submarine Weapon,” A History of Coast Guard Aviation, The Growth Years (1939–1956). SS Bunker Hill was a 10,590 gross ton Type T-2 tanker owned by the Keystone Tankship Corporation. It was 504 feet (153.6 meters) long, with a beam of 68.2 feet (20.8 meters) and drawing 39.2 feet (12 meters). Its engine developed 7,000 horsepower. On 6 March 1964, Bunker Hill was enroute from Tacoma to Anacortes, Washington when it suffered a vapor explosion in the Number 9 cargo tank which broke the ship in half. It sank in Rosario Strait in less than one hour. Five members of the crew of thirty-one, including the captain, chief mate, third mate, quartermaster and steward, were lost. The VS-316A had originally been powered by a 499.8-cubic-inch-displacement (8.19 liter) air-cooled Warner Scarab SS-50 (R-500-1) seven-cylinder radial engine, rated at 145 horsepower at 2,050 r.p.m. In the XR-4 configuration, the engine was upgraded to an air-cooled, direct-drive 555.298-cubic-inch-displacement (9.100 liter) Warner Super Scarab SS185 (R-550-3) seven-cylinder radial engine with a compression ration of 6.20:1. The R-550-3 was rated at 185 horsepower at 2,175 r.p.m. at Sea Level, and 200 horsepower at 2,475 r.p.m (five minute limit) for takeoff. The engine was placed backwards in the aircraft with the propeller shaft driving a short driveshaft through a clutch to a 90° gear box and the transmission. The R-550-3 weighed 344 pounds (156 kilograms).